Rinsing your nose with salt water not only cleanses the nose and prevents colds. Nose cleansing, also called ‘neti’, relaxes the entire nasal cavity and positively affects the surrounding areas: eyes, ears, throat and brain – thus influencing your mental state. Neti can be used to counteract the effects of air pollution, of dust, pollen, bacteria and virus. It stimulates the mucous membranes by the salt water activating the small cilia, which transport impurities up from the windpipe and lungs. Nose cleansing can be used together with one of the yogic breathing exercises, the Blacksmiths Bellows. Apart from drying the nose, it increases the oxygenation of the blood and cleanses the air passages. 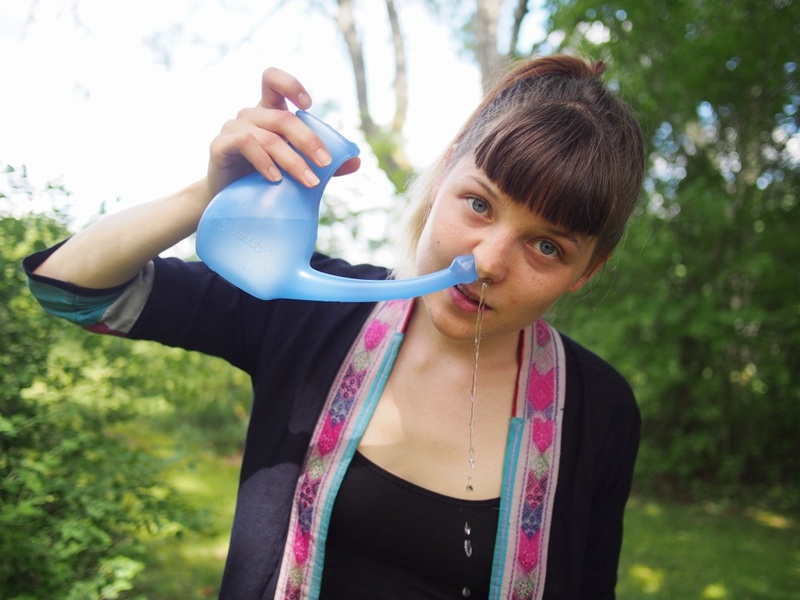 Neti, together with the Blacksmith Bellows, can alleviate sinus problems. Nose cleansing is just one of many cleansing processes in yoga. With a couple of other simple methods, Agnisara and Nauli, the abdominal muscles are moved in such a way that tensions are relieved; together with intestinal cleansing, they clear or prevent clogging of the glands and inner organs are kept fit. Intestinal cleansing, Shankaprakshalana, rinses the entire intestinal and digestive system with saline water. It removes coarse tensions and heightens your energy, and it is said to give you a radiant aura – a state free of tension and full of energy. One of the traditional cleansing processes of yoga is already used by most people, that is tooth brushing.